There are very few macro points in the world that needs to be understood and analysed more than the story of the dragon and its kids. Infact for a generation to come, we may be telling the story of the great dragon which breathed fire and consumed the eagle in the sky. What happens to the dragon after that is the plot where almost everyone has a different ending. Chanos believes China will bust ultimately. He may be right but right now China has not given any indication to that tune. Infact all bubbles burst so too may China but the bubble has just begun. The US bubble lasted 30 years. Anyone guess how long the Chinese bubble may last. My guess is 10 years and hence Chanos may have lost his job by then. May just be employed as a statistician in the Chinese government. Presented below is a series of Chinese data points which may either be thrown out of the kitchen saying they are unbelievable or one may sit down and scratch our heads to see if it makes any sense. To me it does as we cover Asia in great detail. China’s economy resumed annual double-digit growth by expanding 10.3 percent last year, the National Bureau of Statistics (NBS) announced on Jan 20. Gross domestic product (GDP) hit 39.8 trillion yuan ($6.05 trillion) last year. In the fourth quarter, GDP growth picked up to 9.8 percent year-on-year from 9.6 percent in the third quarter, after slowing from 11.9 percent in the first quarter and 10.3 percent in the second. 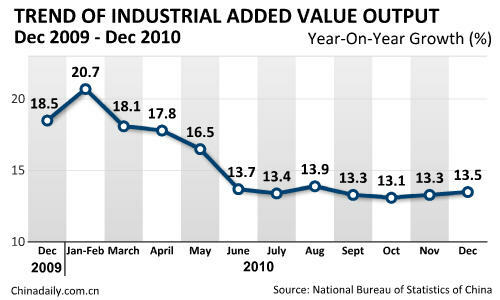 china’s industrial added value output was up 15.7 percent in 2010. The industrial added value output rose 13.5 percent year-on-year in December 2010. China Consumers: Gaining in confidence and wealth! A harbinger for US. China’s retail sales rose 18.4 percent year-on-year to 15.4554 trillion yuan ($2.34 trillion) in 2010. Urban retail sales of consumer goods topped 13.3689 trillion yuan last year, up 18.8 percent year on year; while retail sales in rural areas rose 16.1 percent to 2.0865 trillion yuan. 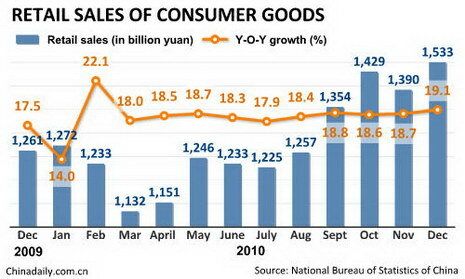 The retail sales of consumer goods in December 2010 grew 19.1 percent year-on-year to 1,533 billion yuan. 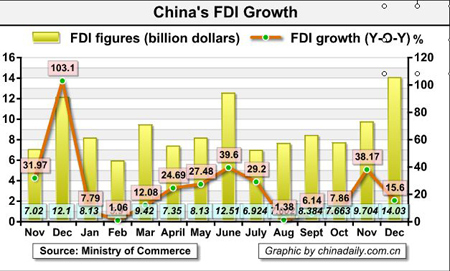 Foreign direct investment (FDI) into China hit a record $105.74 billion last year, up 17.4 percent year-on-year. In December alone, China attracted $14.03 billion of FDI, up 15.6 percent year-on-year, making it the 17th consecutive month of FDI growth since August 2009. FDI in the service sector rose 28.6 percent last year and that in central and western regions climbed 27.6 percent year-on-year. China’s outbound direct investment in the non-financial sector hit $59 billion last year, up 36.3 percent year-on-year. Total outbound direct investment in the non-financial sector amounted to $258.8 billion at the end of last year. 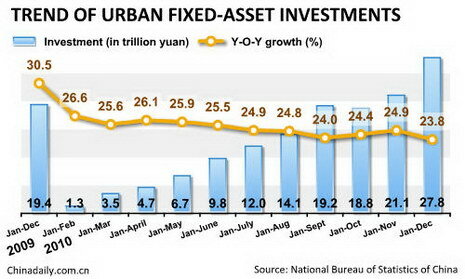 China’s fixed-asset investment rose 23.8 percent year on year in 2010. China’s fixed-asset investment rose 30.1 percent year on year in 2009. One of the best job creation systems is for government to pummel in cash in to creation infra (even if its empty offices) and you have a boom going on for 10 years and allowing the Chinese government to pull the wealth of the Chinese folks many notches. China fiscal revenue grew 21.3 percent year on year to 8.31 trillion yuan ($1.26 trillion) last year. Of the total, the central fiscal revenue topped 4.25 trillion yuan, up 18.3 percent from the previous year, while local governments collected 4.06 trillion yuan, up 24.6 percent, the ministry said in a statement on its official website. 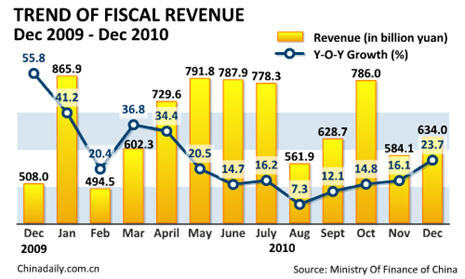 The fiscal revenue for last December surged 23.7 percent year on year to reach 634 billion yuan. 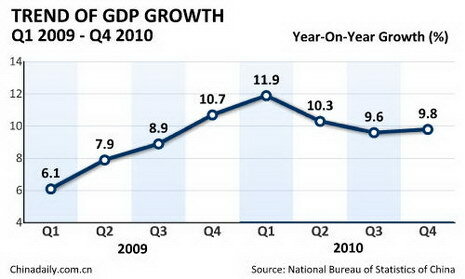 Meanwhile, fiscal expenditure nationwide grew 17.4 percent to nearly 8.96 trillion yuan in 2010. New yuan-denominated lending in China reached 7.95 trillion yuan ($1.2 trillion) last year. The figure was 1.65 trillion yuan less than the 2009 level. 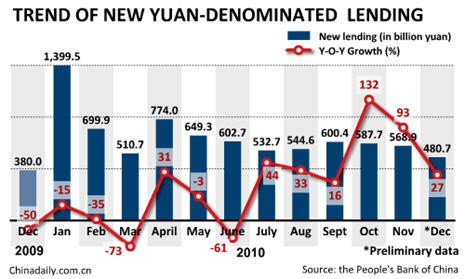 New yuan-denominated loans in December last year stood at 480.7 billion yuan. While Chanos and other have been questioning the GDP surge led by outright lending to the tune of 30% of GDP, one must also take into account the strong reserves to the tune of $2.85 trillion which balances out the lending risk in the Chinese economy. The country’s foreign exchange reserves reached $2.85 trillion by the end of last year, up 18.7 percent from a year earlier. China’s broad money supply (M2), which covers cash in circulation and all deposits, had increased 19.7 percent year-on-year to 72.58 trillion yuan at the end of last year. 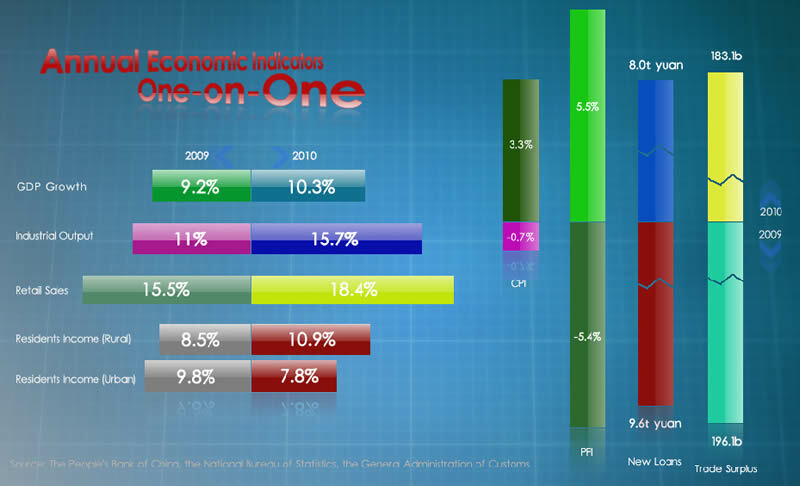 The growth rate was 8 percentage points slower from a year ago, but still exceeded the government target of 17 percent. The narrow measure of money supply (M1), cash in circulation plus current corporate deposits, climbed 21.2 percent from a year earlier to 26.66 trillion yuan. Chinese government had been working to tighten bank lending to curb liquidity and restrain assets bubbles by increasing one-year lending and deposit interest rate twice and bank reserve requirement ratio six times in 2010. While CPI has been on a steady rise indicating the tremendous rise in purchasing power and wage growth, the PPI has led a more systematic rise. China’s consumer price index (CPI), a main gauge of inflation, rose 4.6 percent in December year-on-year. 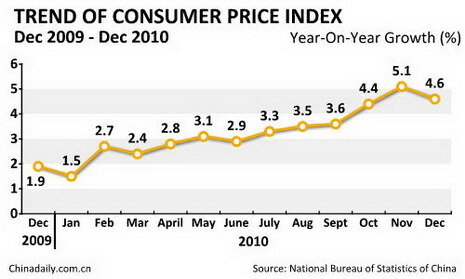 The CPI was up 3.3 percent in 2010 from the previous year. 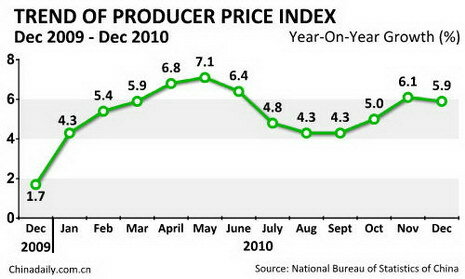 China’s producer price index (PPI), a major measure of inflation at the wholesale level, rose 5.5 percent last year. The December PPI rose 5.9 percent year on year and 0.7 percent from November. The PPI rose 6.1 percent year on year in November, compared with a 5-percent gain in October. 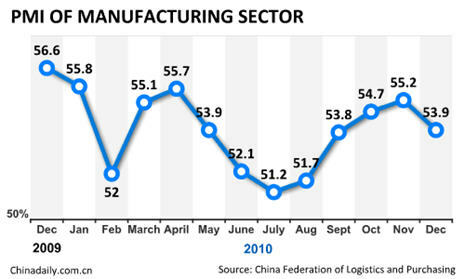 The strong PPI numbers have traced the Manufacturing growth in core Chinese economy. The official Chinese purchasing managers’ index (PMI) edged down to 53.9 in December from November’s 55.2 but still represents expansion for a record 12th month in a row. China’s foreign trade in 2010 jumped 34.7 percent from a year earlier to $2.97 trillion, while trade surplus fell 6.4 percent to $183.1 billion from the 2009 level. In a breakdown, the country’s exports grew 31.3 percent year-on-year last year to $1.58 trillion while imports surged 38.7 percent to $1.39 trillion. And yet little Timmy says: “China does not manipulate its currency”. China today trades at 2900 on the shanghai index and if the numbers stated above are correct, we are sitting on the biggest mismatch in market pricing to the underlying relative to the rest of the world. The joke going around in the analyst community is that Chanos may be on the lookout for a Job and maybe interviewing at the employment bureau in China to be a statistician in the Chinese government. That may or may not happen but Chanos if he truly has shorted the Chinese markets at 2200 in July 2010, may be sitting on the biggest wrong trade ever. China baffles many but there is one number on which there is hardly any dispute and that is the foreign reserves amounting USD 2.5 trillion. 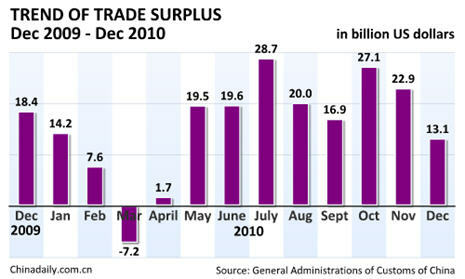 And when a country has that amount of excess surplus, every other number above falls into place. The excess surplus allows China to lend USD 1.2 trillion a year and spawn the century largest infra boom which then produces manufacturing and consumption growth. There in lies the magic of China. It truly is that simple. Is it a bubble? Yes! When will it burst? Not in the near future. On the other hand, US approach to unemployment has been to buy stocks and markets and increase equity in the wane hope that rising equity will spur an already over leveraged consumer to spend. The problem was never equity prices but a structural leverage in the US economy and if USD 2 Trillion had been spent to create infra in the US, imagine the job growth in the US. That would have solved the problem for the US. They got the problem wrong and they have got the solution all wrong either willfully to assit their friends or by sheer mediocrity. For US, the final nail has been hit as FED launched QE2 and there is nothing stopping them from launching QE3 and QE4 but the economy has already said it is now indifferent to QEs. Bond markets in the US have started to breakdown as 10 Year yields break through 3.6% mark giving a cold shoulder to the FED. In my view it is all over for the US as rising interest costs sink the economy into mire never to recover. It will take some time for equity markets to understand but it does not matter any more. China is the place to be. Justin John writes for DawnWires.com and is a Director at a European Hedge Fund. © 2010 Copyright Justin John - All Rights Reserved Disclaimer: The above is a matter of opinion provided for general information purposes only and is not intended as investment advice. Information and analysis above are derived from sources and utilising methods believed to be reliable, but we cannot accept responsibility for any losses you may incur as a result of this analysis. Individuals should consult with their personal financial advisors.